In the 78th minute of last Saturday’s game at Brightlingsea Regent with the score at 0-0 Callum Overton weaved his way into the area near the touchline. His way was blocked by Regent’s Aaron Condon and as the Rooks forward looked to go around him, Condon fell and perhaps to cushion his fall, put both hands out. Those hands landed firmly on the ball, stopping it rolling into the path of Callum. Unbelievably, the two people in the stadium who didn’t see the offence were the two that mattered – the referee and his far side assistant. However, if you take a step back and put the rules to the side for a minute, it is hard to justify how an offence in that position actually warrants a penalty kick. Whilst the handball occurred in the penalty area, it was in a relatively harmless position. Callum couldn’t have realistically scored from that position especially as another defender blocked his way to the goal. So why should that be considered a worse offence than one a few minutes earlier which resulted in a defendable free-kick when Dayshonne Golding was pole-axed on the edge of the penalty area almost dead centre? Perhaps it is time we took a look at the rules around a penalty kick? At a time when the IFAB are keen to tinker with the rules, how long before the spot kick as we know it changes? Whilst it is sure to cause controversy, perhaps it is for the best. Before we consider the ramifications, let’s go back 130 years when the idea created to goalkeeper and businessman William McCrum was presented by the Irish Football Association to the International Football Association Board (IFAB) 1890 Meeting. After a year of debate, the rule changes came into play at the start of the 1891/92 season. However, the rules pertaining to the humble spot kick agreed by IFAB were very different to what we know today. It was awarded for an offence committed within 12 yards of the goal-line (the penalty area not introduced until 1902). It could be taken from any point along a line 12 yards from the goal-line. It was awarded only after an appeal made by the attacking team to the referee. There was no restriction on dribbling with the ball. The ball could be kicked in any direction. The goal-keeper was allowed to advance up to 6 yards from the goal-line. The world’s first penalty kick was awarded to Airdrieonians in 1891 whilst the first penalty kick awarded in England was to Wolverhampton Wanderers in September 1891 in their league match against Accrington Stanley. The rules as we know them today came into play from 1902 with the creation of the 18-yard box and whilst there has been changes to almost every one of the original rules, the basics have remained the same for over 115 years – an offence committed anywhere in the 18-yard box results in a penalty kick from 12-yards out. But is now the time to rethink the rules? At their meeting in Aberdeen earlier In March, IFAB discussed the idea of making any follow-ups to penalties saved by the goal keeper or that strike the frame of the goal “illegal”. It is likely that in the next few years this will become entrenched in the rules of the game but perhaps one change could be under discussed in the next few years is that the penalty area is reduced from 18 to 12 yards, and made into a semi-circle similar to the hockey penalty area. Any offence committed in the area will result in a spot kick, taken from the point on the curve closest to the offence. The more central the offence, the better the angle the penalty taker has. It may be a controversial change to one of the most recognisable aspects of the game but football needs to adapt. If we would have been awarded that penalty last Saturday we of course wouldn’t have complained, although based on our penalty record this year there’s no guarantee we would have scored it! But if we would have scored the only goal of the game, would it have been a just reward for an offence that took place in an area of the pitch where there was virtually no chance of a goal? The football fan says no, the Rooks fan says yes! It’s been another exciting 12 months in National League circles, with plenty of notable events happening during the year. With Christmas fast approaching this is a good time to pick our winners for The Ball is Round’s non-league awards 2018. There are undoubtedly lots of candidates who could come into consideration up and down the country, but we’ve narrowed things down to three top prizes. Having bounced around the lower reaches of non-league football for many years, it was great to see Harrogate Town win promotion to the National League last May. A 3-0 play-off final victory over Brackley Town in front of capacity turnout of 3,000 fans saw Town secure promotion from National League North. There have been ups-and-downs on the pitch during Irving Weaver’s time as owner, but his quest to drive the club up the ladder while remaining financially self-sufficient ultimately came to fruition. The story might not be over yet, with Town currently third in the National League as they chase a second successive promotion. AFC Fylde striker Danny Rowe finished last season with 28 goals and he has continued firing them home this time around. His form drew attention from league clubs, with Cheltenham Town having a £175,000 bid rejected by the National League club back in August. Rowe, who started out at Manchester United, has proved popular with punters using online payment providers for betting on first goalscorer markets throughout 2018. His 15 goal tally this season has got Fylde in the promotion mix again and they could have a battle on their hands to keep him in the January transfer window. Brackley are another club who have spent plenty of time in the lower echelons of the non-league pyramid, but they finally got their day in the sun last May. Their defeat against Harrogate Town in the play-off final could have dented confidence, but they bounced back in style the following weekend in the FA Trophy Final at Wembley. National League side Bromley were strongly fancied to defeat their lower-ranked opponents, but Brackley had other ideas. Town bagged a stoppage time equaliser to send the game to extra-time where neither side could find a winner. They held their nerve during the shoot-out, with Andy Brown calmly slotting home the deciding goal to spark wild celebrations amongst Brackley’s 7,000 fans. Over the past few months, the future of the humble football programme has been front and centre after a decision was taken by the EFL clubs that it was no longer mandatory to produce one for each and every game. There can be no doubt that the original purpose of the programme to educate and inform fans about what was going on at the club, who the opposition were and a vehicle to promote commercial partners (there were more reasons than this but at its core, this was the purpose). Today, our instant-on digital world means most of the content in the programme is out of date as soon as it is printed, with most fans attending a game having access to significantly more up-to-date information in the palm of their hands. Football fans want more today than just a memento of a game attended. On the most part they want content that is up to date and informative, adding value to their match day experience. Further down the leagues, the question of “to publish or not” comes down to money, or more than often, the lack of it. Few clubs can say that they make money on producing and selling a programme today, unless they are simply creating the bare minimum, printing in-house on a black and white photocopier. The programme is a conundrum for clubs at the Non-League level. On one hand, it is a valuable tool to get information over to the fans, whilst on the other it is a commercial vehicle for the club to sell advertising space. Unfortunately, whilst the commercial manager may be happy at selling 20 pages of ads, the reader wants to see editorial and content not ads. So, they won’t buy it and because they don’t buy it, the appeal to the advertiser falls over time. An inverse catch 22. From experience, we have taken great pride in our match day programme, inviting a wide breadth of writers to produce unique and varied content coupled with some excellent match images. Our style and quality of content hasn’t changed much over the past few years, yet the number of copies we sell per game has slowly reduced despite attendances rising by nearly 25% over the last three seasons. We have traditionally sold 1 programme for every 4 attendees. 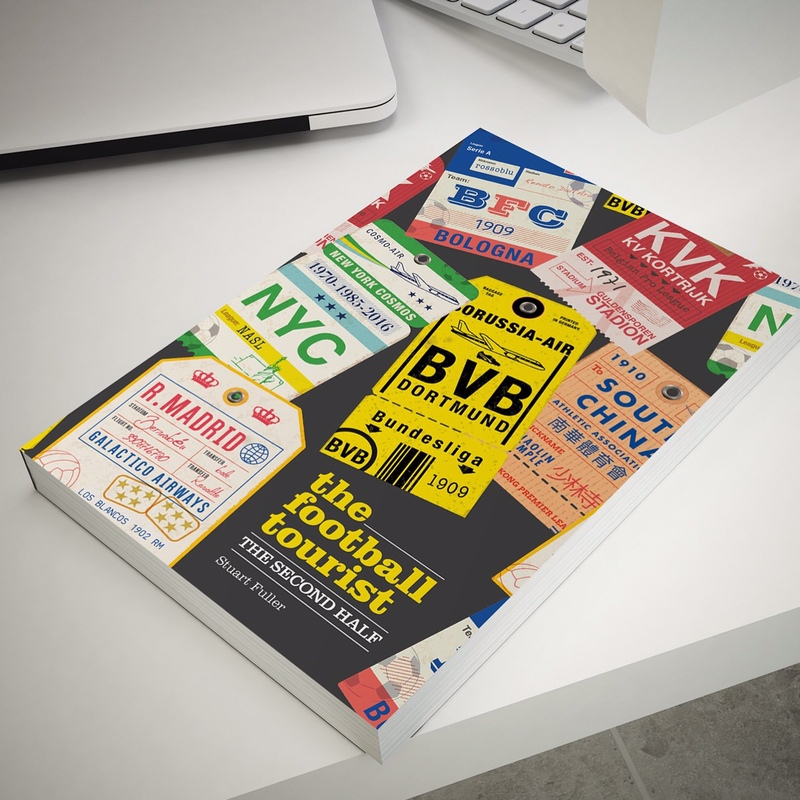 On an average match-day we print 200 copies, 50 of which are used for players, management, guests and officials. The other 150, in most instances sell, at £2 a copy. Multiply that by 21 league games and the £6,300 is a very useful revenue stream. In addition, we have produced an online version, made available to anyone, 24 hours after the game. With over 700 owners living outside of the East Sussex catchment area, we have seen on average an additional 150 views of this. Of course, some of those who previously bought a programme could be now viewing the free online version, thus cannibalising our own sales but likewise, one of the appeals of the online programme is allowing those fans who cannot get to games to access the content. In most instances a programme for a Saturday game goes to print after a thorough edit on a Thursday at the very latest, which means that two whole days of footballing news, views and scandal can break before the programme is printed. We all want to consume our news now – this is the prime reason why traditional hard-copy newspaper circulation has fallen so dramatically and a match programme often contains nothing new to the reader. To many fans, buying a programme is seen as an essential part of going to a game. But like every other element of the game, it needs to get with the times. This is why from the start of the 2018/19 season, Lewes FC will not be publishing a match-day programme. Instead, we will be producing a ground-breaking matchday publication in the form of an e-programme. As soon as fans enter The Dripping Pan on a match-day they will be able to access the digital content, which will include the traditional elements such as a preview of our opponents, match reviews, details of forthcoming away trips and information on what is going on at the club. However, we will be mixing this text-based content with video interviews from our management team, players and the Chairman, previews recorded by visiting fans, and much more. 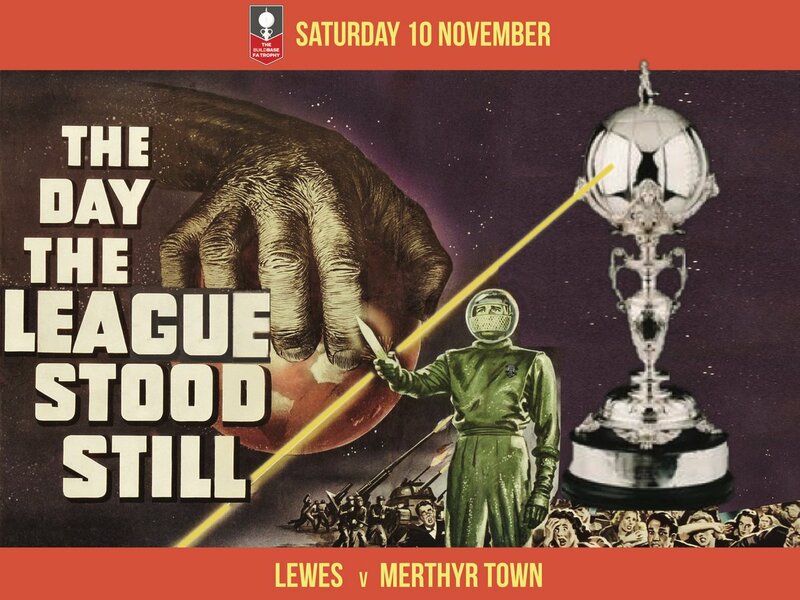 We know it won’t be everyone’s cup of tea, but Lewes have always been about innovation and pushing the envelope for football clubs everywhere. We believe we will be the only club to do this in England and whilst we will be reducing some of our operational costs, we will hopefully be setting the standard for the future of the football programme. The e-programme opens up a whole new world of opportunities, not only for the club but also for the reader. The ability to be able to add dynamic content is a huge opportunity – putting video into the programme, having a live scores feed, making adverts interact with the user (and thus making space more valuable to the advertiser), the opportunity to sponsor players whilst the game is going on and being able to access it from the palm of your hand in real time. Oh, and of course it is free of charge. I’m not a traditionalist but likewise I understand the place for the humble football programme and those who will rally against embracing the digital age. Technology can deliver reduce costs, increased revenues and a wider readership for every club, big or small. But are we ready and brave enough to embrace it? We think so but don’t just take my word for it, have a look yourself. It’s 5pm on a beautiful Wednesday evening in early August and the FC Kaiserslautern team bus is slowly maneuvering itself down a lane not really wide enough of a Smart car in the heart of Saarland, South-West Germany. Die Roten Tuefel, or the Red Devils, may have arrived in style but a few hours later they will leave with their forked tails between their legs. 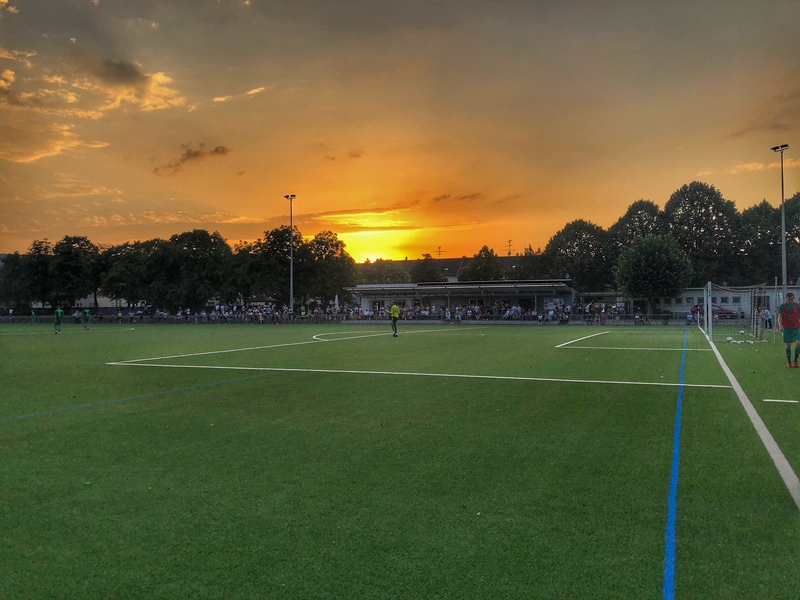 Whilst the team who took the 3G surface in Wiesbach may not have been the Red Devils first XI, this was a competitive game and one that would still embarrass the management of one of Germany’s founding members of the Bundesliga. Shaun Harvey and the management of the EFL must look longingly at Germany (and Spain) and see how the top flight teams are allowed to enter their reserve sides into the competitive league structure. Of course there are rules around who they can and cannot field, as well as a rule that means they can never be in the same division, but it is accepted here in a way that I doubt it could never be back in England. FC Kaiserslautern’s reserve side play in the fifth tier of German football, the Oberliga. Those of you with O-Level German will know that ‘Ober’ in German means ‘upper’, so Oberliga literally means ‘the top league’ or as we would call it The Premier League (well, until the marketing men took their millions for coming up with EPL). Confused? Yep, me too. Werder Bremen had the highest placed reserve team, last season playing in the Bundesliga III but relegation back in May meant they will be in the Regionalliga along with the stiffs from 18 other Bundesliga I and II clubs. 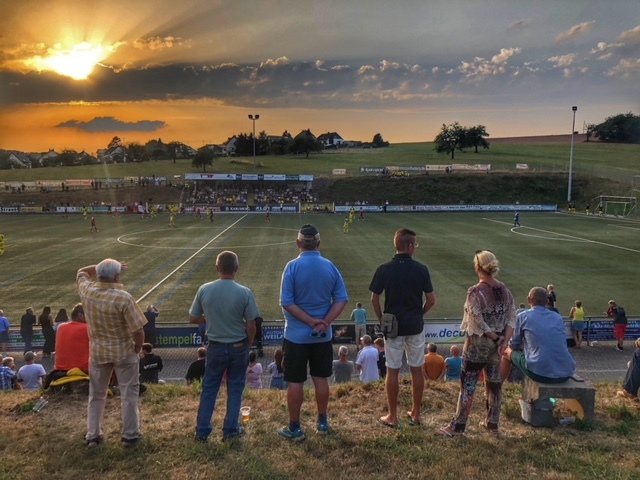 Step down one more level and you will find a host of others including Kaisersluatern II, now playing in the Oberliga Rheinland-Pfalz/Saar along with clubs such as BFV Hassia Bingen, TSV Schott Mainz and today’s hosts, Hertha Wiesbach. One way to look at the similarities between the respective step 5 leagues in the English and German footballing pyramids is average attendances. The Conference Premier/National League in England has some clubs who have certainly had better days such as Leyton Orient, Chesterfield and Wrexham but their core support hasn’t disappeared as they’ve headed down the pyramid. Last season the National League had an average attendance of 2,048 with three clubs (the aforementioned Leyton Orient and Wrexham, plus promoted Tranmere Rovers) averaging over 4,000. Compare that to the Oberliga, which had an average of just 289, with only two clubs out of the 14 leagues with average attendances over 1,000 (FC 08 Homburg and SC Borussia 04 Fulda in case you wanted to know). Facilities at this level are probably on a par with England’s Step 5 or 6. Hertha Wiesbach’s ProWin Stadion was situated in a small valley, with steep hills rising behind the club house and the main stand – perfect on a hot, summer’s night but treacherous I would imagine come the winter. Their 3G pitch provides a facility for the local community, whilst the club-house was advertising a number of events over the coming weeks. Oh, and being Germany, you could have a beer whilst standing on the hill watching the game, trusted that you wouldn’t start a Mexican Wave or some Icelandic Clap. On the pitch it is a different matter – the Step 5 teams here in Germany certainly looked technically as good as our National League, if not better. The home side blew the famous visitors aside, scoring three second-half goals as Kaiserslautern wilted in the sunshine (and bizarrely only arrived with two on the bench). The win, lifted the home side to top of the table, with a 100% record after three league games and no goals conceded. There can be few better ways to spend a hot Summer’s evening than watching football, beer and sausage in hand and Wiesbach delivered on every level. I wasn’t the only one who left with a spring in my step, with the knowledge that David had sort of got one over on Goliath, albeit Goliath’s little brother, Bob. Thankfully the 6.30pm kick-off meant that as I headed south-wards towards my hotel for the night, I drove right past (OK, so there was a 2.5km detour) the Sportplatz Papiermühle (or Paper Mill Sportsfield), where the second half between SPV Dillingen and SV Engers 07, also in the Oberliga Rheinland-Pfalz/Saar was just kicking off. The ground wasn’t too dissimilar to the ProWin Stadion, with one low-level clubhouse with standing in front. A similar demographic of fan was watching this one, albeit with contrasting fortunes to the first match as unbeaten Engers ran out 4-0 winners. Not a bad evening all being told. 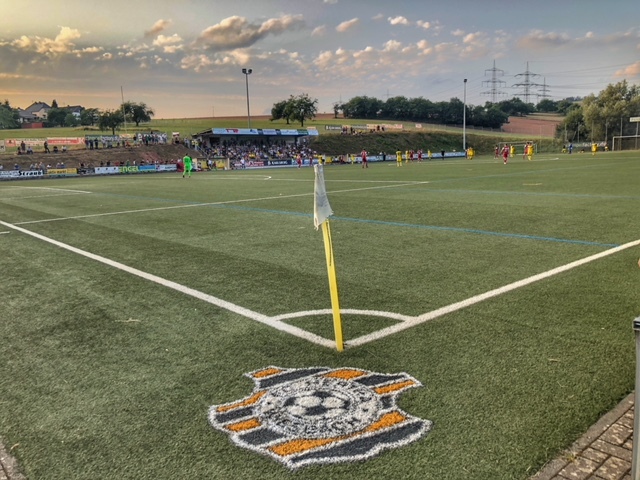 Just like there’s some real gems in and around the Non-League scene in England, seek and you shall find beauty in the most unlikely of places in Germany too. A decade ago this would have been a relatively easy question to answer but today the lines are now so blurred perhaps it is time we dropped the phrase all together. Non-League used to refer to any team that was not part of the Football League but with the creation of the Premier League in 1992, the situation started to change. It would have been unheard of to find a full-time side below the Football League but today, certainly at Step 5 or National League, most sides will be full-time and thus classed as professional players. So, another loose definition of the “amateur game” is out of date. In fact, there are teams at Step 6 who are now full-time, such has the game changed. What brought this question to a head was the “debate” over Social Media last week between Gary Neville, one of the co-owners of Salford City and Accrington Stanley’s Chairman, Andy Holt, over the signing of Aberdeen’s Adam Rooney by Neville’s club. Salford City’s rise through the leagues has been impressive – just over a decade ago they were playing in the North-West Counties League (Step 9). Then came the “Class of ‘92” and their billionaire friend, Peter Lim, and invested heavily into the squad and the infrastructure and the club hasn’t looked back, taking their place in the National League this season for the first time. There’s nothing new in a club getting significant investment and rising through the leagues, although in most cases it does end in tears. I’m not sure the risks of the owners walking away is anywhere near as high at Salford City, but it has caused some bitterness and rivalry from other clubs. Salford’s signing of Rooney has certainly set a new bar though for the “Non-League” game. The Irishman swapped the promise of Europa League football with Aberdeen for the chance to play in the FA Trophy with Salford City, oh and the small matter of a reputed £4,000 per week – or in Lewes FC speak, 150% of our weekly playing budget. Ah yes, the playing budget. Rooney’s transfer set up a war of words between Neville and Holt, with the Accrington Stanley chairman happy to reveal his annual playing budget, but when pushed, Neville wouldn’t reveal the Salford City one, saying “You think I’m going to disclose my wages on here?” (Twitter). Why not? Why can’t clubs all be transparent with their wages? Last season we saw significant amounts of “investment” at Step 7, with Billericay Town signing players such as Jamie O’Hara, Jermaine Pennant and Paul Konchesky. Whilst the owner/manager (until he sacked himself, then re-appointed himself) claimed his wage bill was nothing like the amounts being bandied around the media, they were still eye-watering in terms of the level Billericay Town were playing at, and probably on a par with the amounts Holt claimed Accrington Stanley, now an EFL One club, paid. This season Step 5 of the English Football Pyramid, the National League, contains 11 clubs who have played in the English Football League, plus two (Salford City and Ebbsfleet United) with significantly wealthy owners. It would be an insult to call this Non-League anymore as many of these clubs have facilities and resources that some EFL clubs could only dream of. Money does not always buy success, but it certainly gives you a big head-start and this season few would bet against Salford City being one of the main challengers for promotion to the Football League. They will face some still opposition from the likes of Chesterfield, Barnet and Leyton Orient, all who are desperate to regain their Football League status. Two leagues below Salford City, the Rooks will take their place back in Step 7, the Isthmian League Premier Division, after two seasons at Step 8. We led the Isthmian South division for three-quarters of the season on a budget per week of half an Adam Rooney, winning promotion with four games to spare. We’ve managed to find a modest increase in the playing budget for manager Darren Freeman and we believe we have a squad that can compete rather than struggle. But the gulf between Step 7 and Step 6 is huge in terms of finances and if we were to gain promotion, we would be ill-equipped at the moment to match any of the clubs at the National League South level. Of course, that wouldn’t stop us giving it a go! So, should we stop referring to our game as Non-League? Whilst we all understand what we mean when we say it, we are in a structure, the ‘pyramid’, that gives us a path to promotion all the way to the Premier League (we can but dream). We aren’t grass-roots either. The recent debate about the sale of Wembley and the plan to invest millions in ‘grass-roots football’ may have got us excited that some of that cash could come our way, but grass-roots means just that – the amateur game in its purest sense where facilities today in many instances are an embarrassment to our National Game. For now, I don’t think we have any option but to refer to ourselves as being part of the Non-League game. We all know where we stand, and even if clubs like Salford City want to think and act as if they are already in the Football League, then let them. We will still stand on the Terry Parris Terrace next season, beer in hand and marvel at the part-time players, the volunteers and the beauty of the game we call Non-League.